free bin hire & a lowest price guarantee! Welcome! 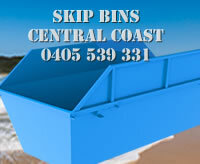 Skip Bins Central Coast has been hiring skip bins on the NSW Central Coast for 12 years. We are a locally owned and operated family business, offering a wide variety of skip bins for household and commercial use. Sizes range from 2m3 up to 6m3. We cover any suburb in the former Gosford Shire Council and Wyong Shire Council areas. For Newcastle please go to our Newcastle page, as there are different Council rules and charges that apply. With our 15 years experience you can be assured we know how to manouevre a skip truck to drop and lift a bin without breaking anything, even in tight situations! Note: Government rules on disposing of Fibro have changed, please check here before ordering your bin. Now with secure payment through Australia's premier secure payment gateway: eWAY. Or you can call us 7 days a week, and we deliver 6 days. We are hiring! Please check our employment page for details. Charged additionally, please put on top of bin: Mattresses ($65), Tyres ($28) each. Gas bottles are not allowed. Gas Bottles can no longer be disposed of in a skip bin or even your household bin. These must be recycled at the COuncil recycling centre or your local Swap n Go outlet.